Is Charlotte ready to land the next big fish like Amazon? Amazon always felt like a stretch for Charlotte. But how about the next big fish? Even though the Seattle giant has passed us by, Charlotte continues to battle for major corporate headquarters when they’re up for grabs. The most recent big success? Honeywell, the Fortune 100 aerospace and tech company that announced in November that it would move its headquarters to Charlotte, bringing some 500 jobs over the next few years. Companies like Amazon need office space, homes for their workers and incentives that convince shareholders they’re getting a good deal. Here’s how Charlotte stacks up on those three counts. Does Charlotte have the office space for a new major company? When Amazon announced they’d look for a second headquarters city, the company said they needed 8 million square feet of office space. That’s roughly the size of Ballantyne. It’s unlikely that any city in the United States has enough empty office space all in one spot to hold a company like Amazon. If they did, that would actually be a major problem. With most major corporate relocations, the company will often send a smaller group of several hundred employees in a first wave. 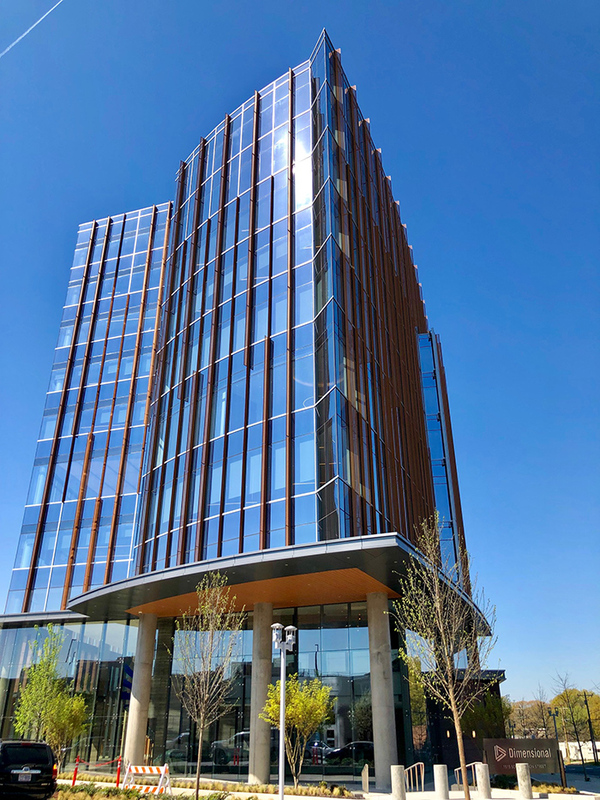 Dimensional Fund Advisors, which is building a headquarters building in South End, is doing just that right now. Should a mega-company go that route, Charlotte seems particularly well-suited. There are 11 office buildings with more than 100,000 square feet of office space currently available, according to the latest available real estate industry data from CoreLogic. 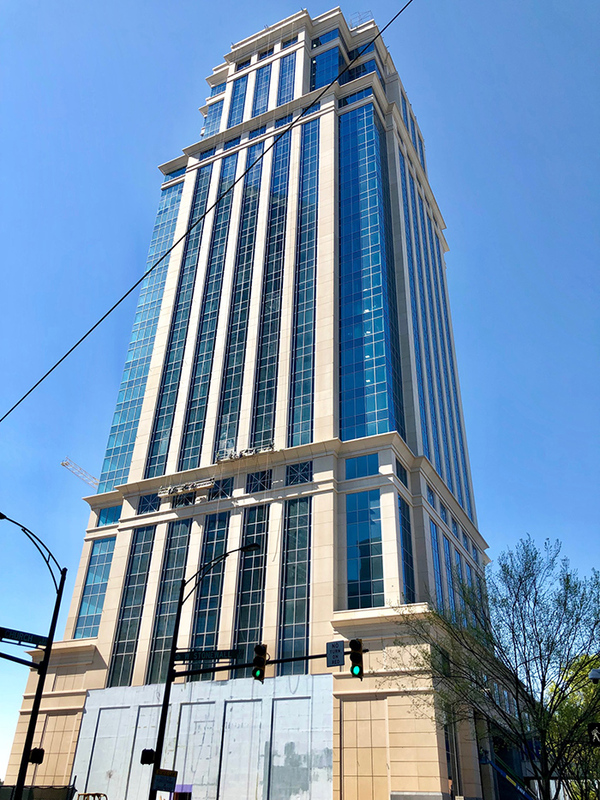 These include Uptown towers like the Ally Center and 300 South Tryon, Ballantyne Corporate Park, and LakePoint in west Charlotte. Another half-dozen are under construction, including the Legacy Union building on Stonewall Street. If you expand the universe out farther to chunks of 50,000 square feet, or enough for 200 to 300 employees, you’re looking at even more options: around 50. “There are enough projects out there and teed up that we stand in a really good place,” said Tracy Dodson, a former senior vice president at Lincoln Harris and current assistant city manager for economic development. Here are some of the bigger opportunities, moving from the center city outward. This Stonewall Street tower is Charlotte’s biggest new office project in years. Deloitte has announced it will be the anchor tenant for the first tower. But that still leaves plenty of room elsewhere in the building, and there are multiple secondary building sites over two blocks. Pioneered by Dimensional Fund Advisors, South End is quickly turning into an office mecca. The Spectrum Cos. recently got approval for two office buildings on five acres at Carson Boulevard and Tryon. Together they’d bring half a million square feet of office space. 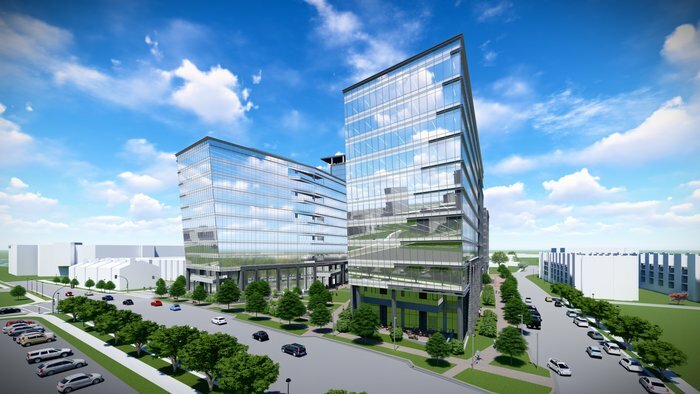 Rendering by LS3P Associates via Spectrum Cos.
Just down the road, Portman Holdings has a two-acre site in South End in rezoning that the company purchased from Shook Kelly for $12.7 million. With plans for about 250,000 square feet of office space, this is roughly one-quarter the size of a building like the Duke Energy Center. That’s not nothing: Most companies wouldn’t be able to fill even that. Beacon Partners’ The RailYard is still leasing, and Childress Klein recently filed plans for a development on Camden Road in partnership with Ram Realty Advisors that would bring another quarter-million square feet of office space. This 76-acre development has gotten a lot of buzz for the cool (small) tenants they’ve already brought in. But they’re still waiting for a major company to take on the project of redeveloping this former munitions depot and Rite Aid distribution facility. The city of Charlotte has tried for years to find a solution for the former mall site after buying the property and razing the old buildings. But it’s close to Uptown and ripe for the taking. Charlotte Douglas International Airport has steadily gobbled up hundreds of acres of west Charlotte land, with plans to develop it into a major industrial and commercial center. In terms of short-term development, the airport area has the most potential. The opportunity here extends south to Steele Creek. Childress Klein recently filed rezoning plans for a 250-acre parcel off Arrowood Road for an industrial-heavy site that might also include a hotel and homes. The far western end of Mecklenburg County will soon be home to the most ambitious development project in recent Charlotte memory, the River District. Described as the next Ballantyne, this area could one day be home to those 8 million square feet of office space a company like Amazon demands. While it might take a decade or more to be up and running, the River District will be underway sooner than you might think. An apartment community is expected to break ground in 2020, with the first residents moving in by 2021. Once you get outside Mecklenburg County lines, the former Philip Morris site in Cabarrus County is among the sites with the most potential. Does Charlotte have enough homes for a new company’s workers? But office space isn’t the only real estate that companies care about. Once companies get a short-list of cities, they’ll start looking at the residential market as well. This can be a surprisingly big deal. In the case of Honeywell, Charlotte economic development officials arranged for each prospective employee a personal tour of housing options. Charlotte’s housing market has been on an incredible ride since the Great Recession, with home values skyrocketing and homebuyer competition hot. Charlotte is running out of buildable land, there’s a perennial worry that the city does not have enough housing stock to satisfy demand. While these are relatively new concerns for Charlotte, they’re circumstances that many CEOs are long accustomed to from cities like Seattle, Chicago or New York. By comparison, Charlotte real estate still feels like a steal. “We have not heard any pushback of there’s not enough housing stock or anything like that,” Dodson said. Instead, Charlotte touts three things: Travel times, traffic and home values. When talking with prospective companies, some of their workers want new construction, while others want to live in an urban neighborhood. Dodson said one Honeywell executive had been living on a five-acre farm. At this point, commute times allow Charlotte recruiters to pitch living not only in Mecklenburg County, but in Gaston, Union, Cabarrus, Lincoln, Iredell, York and Lancaster counties as well. What’s I-77 when you’re used to commuting over the Brooklyn Bridge? “We think our traffic is getting worse, but if you’re looking at somebody coming out of the Northeast, we’re not bad at all,” Dodson said. Are Charlotte’s corporate incentives and recruiting enough? Increasingly, economic development is a zero-sum game. Companies regularly cast about for the most generous incentives that state and local governments are willing to offer. Charlotte’s attractiveness in terms of incentives is primarily governed by the state of North Carolina. Its major incentive program is known as the Job Development Investment Grant, or JDIG. Essentially, this program gives companies a cash award equal to a percentage of the personal state income tax withholdings their new jobs create. That way, the state never loses money on the deals. Charlotte and Mecklenburg County kick in their own cash grant incentives using a similar structure, just with local taxes. While North Carolina has steadily increased the amount its willing to offer companies, other states like South Carolina remain willing to offer more. Of course, it also takes talent to make the pitch. 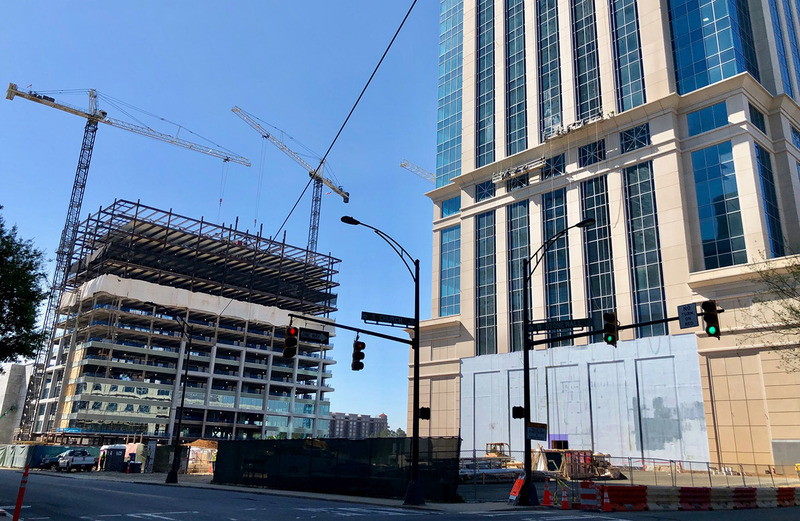 Charlotte’s economic development world has been in flux over the past year as the Charlotte Chamber and Charlotte Regional Partnership merged, with both organizations’ leaders leaving. Now, the city of Charlotte is taking more of a leadership role in corporate recruitment. Under Dodson’s leadership, the city is trying to make economic development a more collaborative approach. Dodson said she’s meeting regularly with the development community to find out what new projects they have in the works, when they might be ready to open, and what they’re hearing from potential tenants. With the city involved, there’s also the opportunity of streamlining permitting and other development-specific concerns. Will all this be enough to land a big fish like Amazon? It’s unclear. But Charlotte will certainly keep trying.